As with most things fabulous from the past, the women are on it first. Take the Minnetonka moccasin, made in the USA from the finest leathers since 1928. 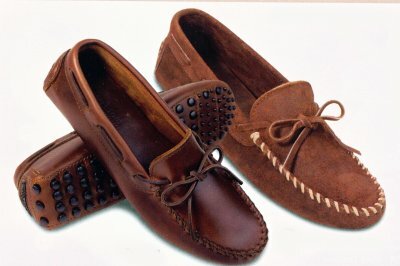 Before you assume that moccasin means cheap suede embellished with plastic beads, check out their website — and look twice at their amazing prices. Makes you wonder why you spend so much on a pair of Tod’s loafers, doesn’t it? Our favorite is the men’s original cowhide driving moc, crafted from the softest leather and finished with a nub sole for years of use and abuse. Pair with a button down and jeans for a casual summer look that sets you apart from the herds of ironic jeans and statement sneakers. This entry was posted in Accessories, Bargains, Fashion, Footwear. Bookmark the permalink.